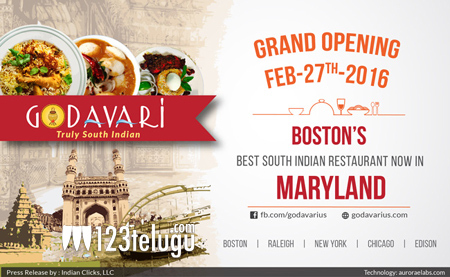 Maryland Metro, February 27th, 2016: ‘Godavari’, the fastest growing restaurant chain in the United States, offering South Indian cuisine, is opening a restaurant in Gaithersburg, Maryland in the Metro Washington D.C. area on February 27th 2016. The celebrated chain opened its restaurant in Edison, New Jersey on February 20, is seeing a tremendous response. In its trademark style, Godavari will be serving authentic dishes with home-made recipes offering memorable dining to the people in Maryland and Metro Washington areas. The 120-seat restaurant is located with close proximity to cities of Baltimore, Washington D.C, Rockville and many more locations with a huge South Indian population. The Grand Buffet on the inaugural day include recipes like “Sharma Dhaba Aloo Fry”, “Avakai Chicken Wings”, “Bezawada Baathu Pulusu”, “Nizambad Nimmakaya Kundelu”, “Chittemma Gari Chethi Garelu”, “Rathamma gari Royyala Pulusu“, “Pedarayudu Peethala Iguru”, “Sridevi Shahi Tukda” and many more. Godavari buffet will also be the biggest lunch buffet in the state of Maryland and Metro Washington DC area. Kamakshi Tumalapalli, Franchise Owner for Godavari, Maryland, also expressed her happiness saying, “I am very happy to be a part of the vibrant team of Godavari and I specifically thank Koushik Koganti and Teja Chekuri of Godavari for making my years-old dream of opening my own restaurant, and to cater to the taste buds of the Indian community, come true”. Pradeep Ravella, Franchise Co-owner of Godavari at Maryland location expressed his happiness becoming a part of the restaurant chain. “I am very impressed with the way Team Godavari helped us set up a huge restaurant in such a short time. I am excited about serving the truly native spread for the Indian Diaspora and make them feel at home,” said Pradeep, who is also a film distributor in Maryland area. Godavari Franchises are lined up for opening in the states of Delaware and Dallas; and is eagerly working with many enthusiasts in taking the South Indian cuisine to many more parts of the United States that have been underserved to date. As part of its value-added measures, Godavari is coming up with an innovative mobile Application so that customers don’t have to call the restaurant and instead can plan their dining through the user-friendly App. While alluring the Indian gourmets across the US, Team Godavari is also contemplating entering countries such as Canada, Singapore, Australia and the UK. In a statement, Godavari NJ Team has extended thanks to the Police and Fire Departments of Edison for helping Godavari at Edison to streamline the grand opening and control the crowd at the location. We TRUST that Godavari food continues to delight MARYLAND customers starting from 27th of February with a Special Grand Lunch Buffet! !